Sorry for posting more fall looks, but these are so cool! I LOVE the styling, photography and outfits! I must have a thing for pants because, once again, my favorite is the blue-ish suit...PERFECTION! I also hate how perfect the models hair looks even though its going all wild...why can't everyone's hair be like that? I like these pics so much!! This is a great spread, I love the architectural details in the background juxtposed with the model's hair. that star dress, in mini form, would be amazing. I especially like the sleek business outfit. I am always looking for tailored pieces that can help me not look frumpy at work. Why are all affordable women's work clothes so frumpy? great inspiration - thanks for sharing! With looks like these I can't wait for fall! That suit is beautiful and these pictures are great..thanks for sharing! I agree with the hair comment! I have the most frizzy hair and if I walked out of the house looking similiar to the model, it would look nowhere near as glamerous. People would probably redirect me to a mental facility. I am loving these pictures girl! Hope you can check out my blog! Comment if you like, follow if you love! great shots! love it! thanks for inspiration for me! I love these photos! I'm really a fan of the fall trends, so great. i really like the pantsuit, as for the hair...its a little to wild for me...seriously that hair would swallow me up. wow! love all this photos!!! Super duper cool shots indeed! 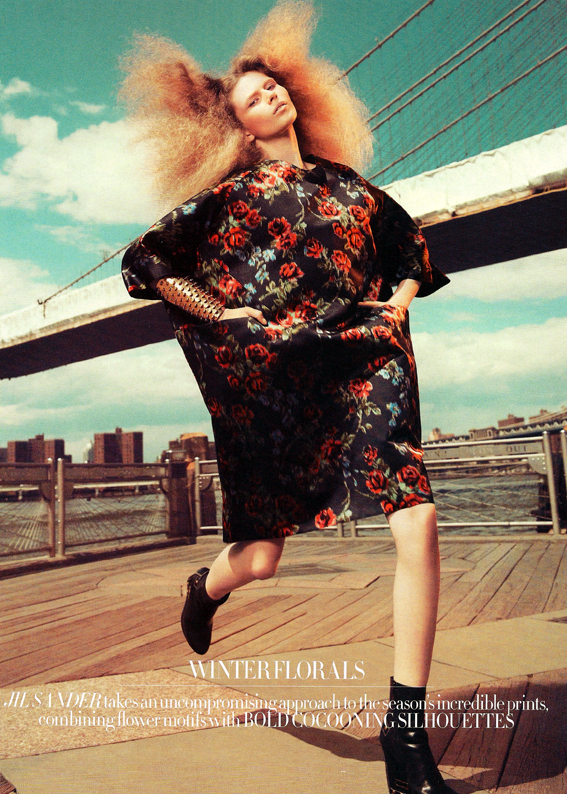 Pretty editorial, but I don't like the hair. The hair is so cool! I'm SO loving these Fall trends. Very cutting edge. So funny about mentioning wild hair. I have definitely been feeling that vibe lately! I can't get enough of the fall looks either. Gorgeous. Oh, these are fabulous. Great designs. Thanks for sharing.